Although some Italians might not agree, I like some of the original pasta combinations that the Japanese came up with. 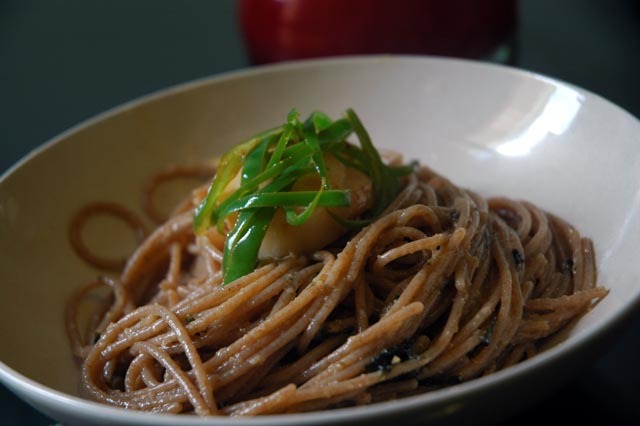 In particular, mentaiko or tarako pasta is a winning combination of Japanese flavours. For this recipe, I used a fairly classic way of making a seafood based pasta sauce, as if I was making Pasta alla Bottarga. I also added a seared scallop and a slight regional touch of green chilly on top. The other peculiarity is that I used organic wholewheat farro pasta. Farro is a particular type of Italian grain. You can buy this type of spaghetti at the most popular "Cold Storage" branches. Peel a few cloves of garlic and crush them slightly maintaining their overall shape. Wash and remove seeds from a couple of green chillies, and cut them in Julienne strips. Trim a large sheet of Nori seaweed into very thin strips. Bring a large saucepan of water to the boil and add a handful of rock salt (the water must taste salty but not too salty). In a skillet, sear the scallops until ready and wash with some white wine during their cooking. Remove the scallops and set them aside, put the pasta into the boiling water and stir well. Cover the bottom of skillet used to sear the scallops in olive oil, heat it for a few seconds and put the whole garlic cloves into it, adding some dry chilly flakes. Let the garlic slowly turn golden keeping the oil temperature under control, then add a dash of white wine and evaporate it. Add some starchy water from the pasta and keep topping up as the water evaporates and the sauce thickens. This will help you balance the consistency of the sauce, making it juicy and non oily. Remove the garlic, put the chilly into the sauce, cook for a few seconds, remove from the sauce and set aside. When the pasta is ready, drain it and mix the seaweed into the sauce making sure it's well stirred in (be careful as nori tends to stick together in lumps), then put the pasta into the skillet and stir well. Serve the pasta onto plates and unevenly stir in the mentaiko while on the plate (mixing the mentaiko into the skillet would cook it and spoil its tangy flavour). Finally, top with a scallop and some green chilly.